If you are curious about image analysis and classification as well as in machine learning, keep reading. I will use a case I studied myself to introduce you these themes. In the first place, I was looking for a way to analyze resumes’ display. I thought about making an “Accept” or “Reject” machine learning tool based on resume layout. A not very clean layout often goes with a not very serious candidate. To say that roughly, my problem was a binary classification problem based on details extracted from a file. To familiarize with image recognition, I decided to try comparing images of cars (Fiat 500) to images of giraffes. Don’t ask me why I chose this example, I’m still wondering! However, the purpose of this article is just to highlight my approach of this problem and to provide you key tools to proceed to your own images classification. Before starting, it is important you know I worked with a 3.x Python environment for this first part. 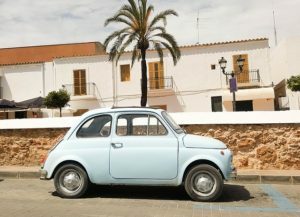 I downloaded in separated folders 20 images of giraffes and Fiat 500 respectively, and 16 for testing. Then, I used image_to_matrix function to resize and then convert all those images to 3 dimensions numpy arrays (300, 150, 3). Each component of the array is the RGB code of a pixel. After having flattened every matrix to a 1-dimension vector (1, 300 x 150 x 3) thanks to flatten_matrix function, I gathered all vectors in a big array called data. I did the same with my test directory to obtain my test_data dataset that is useful to get the accuracy of my classification. I used RandomizedPCA from sklearn library to reduce the dimension of each vector, representing an image, to 2 dimensions. This way it was easier to have a rough idea if the classification result would be accurate, thanks to a simple 2D plot of each picture coordinates. Intermediate conclusion: classification will not be very easy by this way of processing because it is hard to see a clear separation between blue and yellow dots. Let’s confirm this. I then decided to reduce the dimensions of my train and test vectorized images to 10 components. 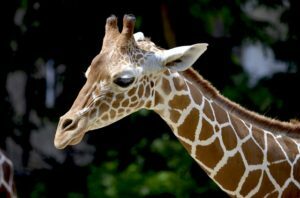 I used two classifiers from sklearn library, RandomForestClassifier and KNeighborsClassifier, to see how much time they could predict well if a picture from test directory was a car or a giraffe. Obviously, I trained them before on the train dataset. The average scores I obtained are the following: KNeighborsClassifier: maximum 71% of correct prediction for a number of closest neighbors n_neighbors fixed to 6. RandomForestClassifier: 68% of correct prediction. This way of processing is not accurate enough and the reason could be that it is only based on colours found in the images. Maybe it could fit well to issues such as classify fruits or objects which have a fixed colour. Nevertheless, in my case, I had to find another more convincing classification model. I continued surfing the web for better tools and I soon came across a very powerful python library when it comes to images: simpleCV. I installed it with the invaluable help from this website. I also installed Python 2.7 because I had always been working with a 3.x version but simpleCV doesn’t support it yet. Then I started looking into its main features. It offers a large number of extractors which are classes able to extract data from pictures. EdgeFeatureExtractor – gathers in bins lines’ length and directions in a picture. The library offers some machine learning tools enabling users to use well-known models directly on pictures. I initialized three extractors. See documentation to know their parameters. Then, you have to pass your list of classifiers as input for your classifiers. As in every machine learning process, you will have to train and test your classifying model on different datasets. In my case, the work is done on images but we will see that, behind the scenes, it still relies on datasets. It is interesting to notice that train and test methods have a savedata parameter which enables user to save extracted data as datasets in specified files. print "---------------------Results of test session ----------------"
Looking at the results, it seems clear that TreeClassifier is the best choice to solve our problem. Also, I noticed that using EdgeHistogramFeatureExtractor as the only feature extractor gave the same or better scores so don’t be surprised if you don’t see the others thereafter. Time to try to find the best configuration for our problem. What I can change to improve the accuracy is number of train images, parameters from my extractors, number of extractors and parameters of my classifier. For example, we can try compare the score of a TreeClassifier with flavor parameter set as ‘Forest’ and another with same parameter set as ‘Boosted’ (lots of little trees vs highly optimized trees) on the number of bins of my edgeHistogramFeatureExtractor. For this we will use matplotlib library. 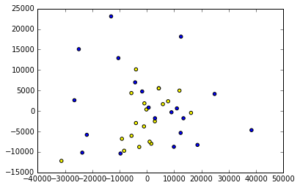 Then we display a graph of each classifier’s success score depending on the number of bins of the EdgeHistogrameFeatureExtractor. 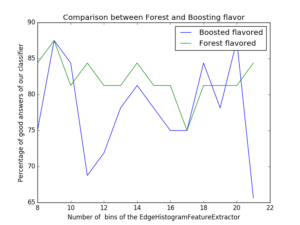 # Comparison of tree flavour "Forest" and tree flavour "Boosting"
The graph displays that the ‘Forest’ flavored classifier seems a bit steadier than the other one for different bins number. However, what matters is to get the highest score. That’s why I will continue with the ‘Boosted’ model and use the number of bins where it scores the best: 20. Thanks to step 4, we were able to determine which custom classifier is the most accurate for our problem. Let’s confront our model to new pictures! For that, we will use the ImageSet class which is convenient to show pictures and the results of classification. On 10 random pictures, the model was correct 8 times (see video below). The model is not perfect but the accuracy is satisfactory since not so much data was provided and not so much time was devoted to parameter optimization. It could easily be improved by doing the latter and adding a lot more training pictures. To bring image analysis to a classical machine learning problem with datasets, I used simpleCV documentation to create the function saveData that would make it possible to convert images into datasets of extracted features. You can use saveData to change your train folder into a train dataset. print "Warning: No features were extracted"
After that, you can try to create and set your own classifiers with existing machine learning library such as the famous scikit-learn library. Indeed, simpleCV classifiers are not very customizable so it would be profitable to use another library to get more accurate results. How about you try to classify your own objects now? I would be glad to hear about the results you get whether they are good or bad!